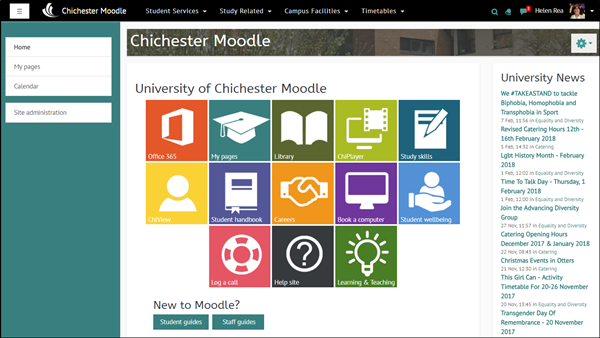 Your Moodle homepage contains a dashboard with links to resources you may require on a daily basis: email, online storage, Office 365, module information, library resources, University news, support information, and ChiView (your academic record). 'My pages' lists your academic module information and department pages. Moodle is mobile friendly so you can use it on your phone or tablet. Accessing your modules through My Pages. Some/all of my Modules are missing! Your Moodle modules are from Registry, so you can only access modules that you are registered on. If you are still to register onto a module, you will not have access to it. If you have fully registered and still do not see your modules, please contact the SIZ desk as there could be an error in Registry. Moodle is a copy of what appears in Registry, so you can only access modules that you are registered to. If you are seeing incorrect modules, it is very important that you report this to the SIZ desk as there may be an error in Registry. Why is my module empty? Your lecturers have full control over the content on the Moodle pages. If a page is empty, it could be because they are still to upload content. If your lecturers are not using Moodle, feel free to chat to them about what sort of information and activities you think would help your learning at the University. Your lecturers can find support in the Technology Enhanced Learning (TEL) Team who can help them to set up learning resources and create activities. If you feel uncomfortable talking directly to your lecturers, feel free to contact the TEL Team via TEL@chi.ac.uk or on 6155, and we will contact them on your behalf. Alternatively, you could approach your Student Rep, Head of Department or Department Administrator, who can book training on their behalf. Why have I got a 'Too many logins' message? If you see this message, fully close down your web browser (Internet Explorer, Safari, Firefox, Chrome, etc) and then try again. If you get the message again, please report this to the SIZ desk. You should be able to access Moodle from anywhere with internet access. If you are encountering problems, please contact the SIZ desk.